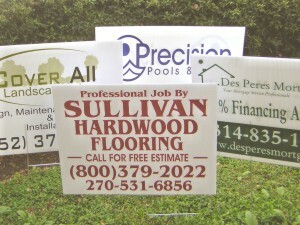 The 30 MPH rule is important for the effectiveness of a custom yardsigns campaign. commit the name to memory. Sizes below are used for stand by traffic. (At traffic light parking lots and subdivisions). Sizes below are used for slow traffic. Sizes below are used for medium traffic. Get price 24"x32" Get price 24"x36" Get price 24"x48" Get price 36"x36"
Get price 48"x48" Get price 48"x72" Get price 48"x96"
FAST SHIPPING! on yardsigns We ship to all 50 US states.